It's spring and the almond trees are covered with shiny leaves and growing nuts. The trees are beautiful and full of new life. As they grow the 2016 harvest crop, they need fertilizer to help them grow. Fertilizer is like plant food or vitamins that give the trees a little extra boost. 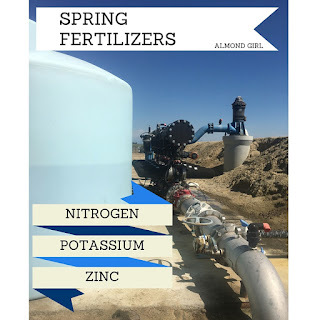 Just like you feed your garden fertilizer, your rose bushes plant food, or like how you take your daily vitamins, we feed our almond trees fertilizer. We prefer the fertigation method to fertilize our trees through the water in our irrigation drip hoses. This helps us to be more efficient and effective in our fertilizer use. When we fertilize in the spring we use three different kinds of fertilizers; Nitrogen, Potassium and Zinc. It is like a farmers version of a a perfect vitamin combination. Nitrogen is important to help encourage leaf growth and nut development. Nitrogen provides the building block to form protein and oils. One of the key reasons you probably eat almonds is because they are high in protein. 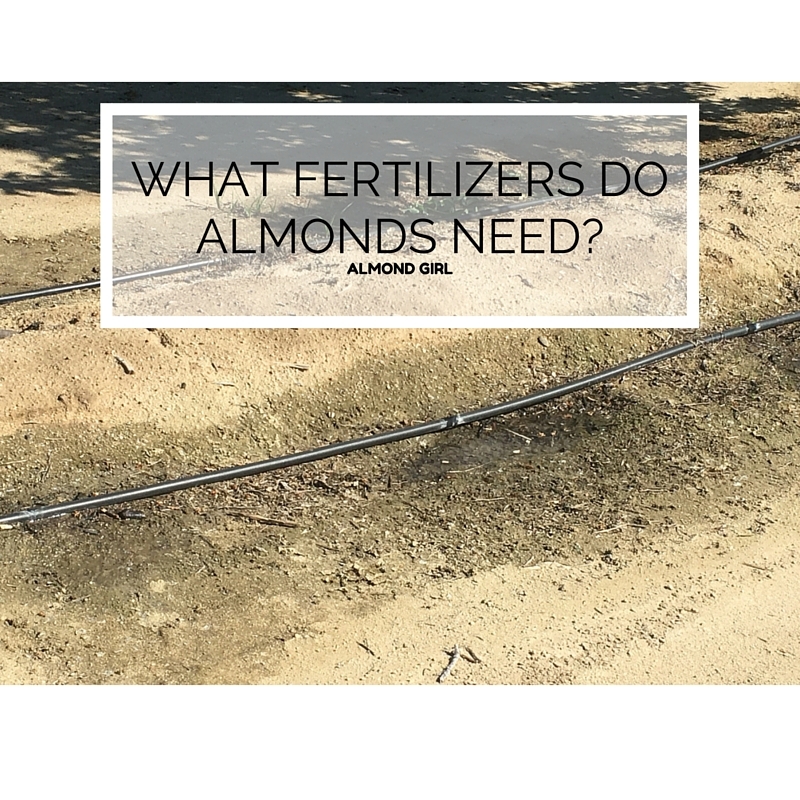 By us adding nitrogen to the soil, we are ensuring the protein levels will develop in the almond. Almonds also have great natural oils, making almond oil a great ingredient in your shampoo or making that almond butter extra creamy. Nitrogen deficiencies in an almond tree can cause chlorotic older leaves, or most commonly referred to as yellowing leaves. We want the leaves to be healthy and full or nitrogen. We have to be very careful when apply nitrogen because it is so mobile. We don't want it beyond the tree roots or else the tree will not be able to properly use the nitrogen. That is why using drip irrigation is a great tool for nitrogen because we can slowly apply it perfectly to stay in the root zone. Potassium is another fertilizer almonds need. 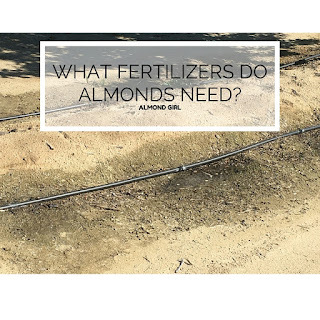 Almonds take up a lot of Potassium from the soil in developing their nuts, so we need to replenish this into the soil so they can continue to thrive. Just as people require the perfect level of potassium, so do trees. The almond nut uses and stores a lot of potassium, similar to how a banana has a lot of potassium. It is a difficult element to extract from the soil, so we have to apply the potassium to ensure proper nut development. A lack of potassium will cause the entire tree's leaves to discolor yellow. This would cause the tree to stress and be sick, and we want healthy and happy trees! Zinc is the last of our spring fertilizers we use. If almonds don't have proper amounts of zinc it will lead to chlorotic leaves on the younger tissues. It will also lead to shorter distances between the leaves on a branch with a malnourished zinc tree. We have to ensure there is ample amount of zinc in the soil and tree by applying through the drip system to get right at the root zone. This application process will speed up the absorption into the tree. Zinc is not very mobile in the tree or soil either so fertigation is a saving grace for applying zinc. It is important for farmers to test our soil pH prior to applying fertilizers so we know what our soils are deficient in. Our trees are our babies, and we want to make sure they have the vitamins they need to thrive. Consider it their toddler doctor check up! Our trees don't talk to us, so by paying attention to their leaves, tissue colors and testings we can learn what they need. We apply these fertilizers in the spring to allow the tree time to grow properly and have properly developed nuts. Soon our little almonds will be all grown up and ready to be harvested!